Moisture-Lock(Preventing dry skin): contained sodium hyaluronate.Skin whitening: Contained mineral powder of pearl and arbutinWrinkle Prevention: contained adenosine. 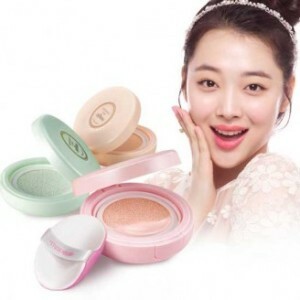 Improve skin tone, cover blemishes.Easy-to-use magic cushion case.This is the BEST face makeup primer for you•Net wt. 15gColor:- Pink - For a white and pale skin type. Transformed into a good complexion and healthy skin tone.- Mint - For a facial blushing skin type. Transformed into a uniform and bright skin tone.- Peach - For a dark and dull skin type, Transformed into a bright and clear skin tones.